How do you train to be a tennis umpire? A group of people are yelling the word "out" as an instructor drops a tennis ball next to a painted white line. Those with the loudest voices and best timing will pass the first stage of the Lawn Tennis Association's (LTA) training course to become an umpire. The courses are held at the National Tennis Centre - a stone's throw, or a mishit forehand, from Richmond Park in south-west London. Anyone can take the test, but only those with some specific qualities pass. Eyesight is obviously important - umpires must have 20/20 vision, corrected or uncorrected. So is knowing the rules of tennis. In the US, the United States Tennis Association has put its rule guide online, with 230 pages of questions such as what to do if a player grunts too loudly or injures their opponent, and where a player should place their towel. Emily McGuinness passed the LTA's line umpire course in 2014 and is now on their development scheme for star umpires of the future. The recruits have set up a WhatsApp group in which they regularly test each other on the rules of the game. She says having a loud voice is crucial to being a good umpire. "It is quite unnatural for most people to shout really loudly, so it takes a while to get into the habit of that." Umpires need good reaction times because players hate it when an official makes a late call. But they must not be too quick - some aspiring umpires fail the course because they call before the ball lands. Reaction times are particularly useful when tracking a 157 miles per hour serve by the American John Isner, then ducking out of the firing line after making the call. Most umpires have a day job that does not involve being on a tennis court. There are umpires who also work as medical doctors, university professors, priests and a NASA engineer. Father Paul Arinze, a Catholic priest from Wisconsin, US, has umpired matches at Wimbledon, the Australian Open, the US Open, and last year's Olympic Games. He says being used to talking in front of a congregation helps him control his nerves during tennis matches. When players are angrily questioning a call, he can keep his cool. After all, he is a specialist in forgiveness. "I understand how players react in the heat of competition and that they do not mean what they say," he says. "It is important not to make the situation worse - even if you know you are in the right." Umpires can discipline a player for breaching the rules, and they are given a list of swear words in different languages to listen out for. Players have calmed down since the days when John McEnroe, Jimmy Connors and llie Nastase threw tantrums at an umpire in front of millions of TV viewers. But the job still has its dangers. Earlier this year, Arnaud Gabas ended up in hospital after Canadian player Denis Shapovalov accidentally struck him with a ball and fractured a bone under his left eye. Umpires need total concentration to track the ball over the course of a match. "I had not realised how much effort it is to focus for that long, it is different to sitting at your desk working on a computer," says Ms McGuinness, who also works in marketing for the charity CARE International. Fr Arinze says umpiring has improved his concentration, which helps him to carry out his duties as a priest. "When I counsel someone, they can speak for a long time but I maybe only need to reply to 20% of what they say, and it is important that I do not miss that part," he says. If an umpire has a good match, they will barely be noticed by spectators. But there are exceptions. Swedish umpire Mohamed Layani, who is regarded as one of the world's best, has a cult following among tennis fans. His distinctive call of "fifteen-love" has even been sampled in a rap song. Get in touch with the Global education series. Continuing professional development is an important part of umpiring. Officials are watched every match and given feedback on their performance by more senior umpires. Officials start out as a line judge, and those with the best scores progress to calling the score from the tall umpire's chair. Major tournaments like Wimbledon are hardest to umpire - there are bigger crowds and better players who hit the ball harder and faster. Dr Kris Jaeger-Helton, an engineering professor at Northeastern University in Boston in the United States, rose through the ranks to become a chair umpire alongside her studies. She says she tries to build trust with players and students alike. "One time, when a player arrived at court and said: 'I'm glad you're doing my match, you always look out for us,' I wanted to bring that tone to the classroom as well," she says. Whether in the classroom or officiating a tennis match, "it is better to conduct the activity rather than to have to be in charge or control it". She adds that, although training engineers and chairing tennis matches need to be taken seriously, "sometimes it is okay to lighten up a little". "You've got to enjoy what you do and let it show in the balance," she says. 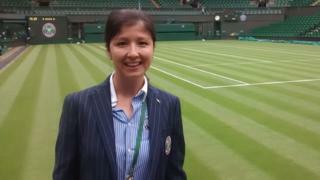 The Lawn Tennis Association's information about becoming a match official.